What could the casino of the future look like? by marc / Thursday, 12 October 2017 / Blog Category: Everything Vegas and Gaming. You may not have noticed this but Las Vegas casinos have been changing over the past couple of years. After spending a week with gaming manufacturers and casino operators I can say that changes will continue with a similar but new vision for the casino floor. The future is always changing but I heard some interesting thoughts on casino floors may look like in the future. We recently looked at the new slot machines coming to casinos in the next year (18 NEW themed slot machines you’ll want to play). New skill-based games like Cannonbeard’s Treasure and Gamblit Poker are just hitting casino floors in Las Vegas. The games are occupying some space previously devoted to slot machines but not too much. These games are still new and may or may not be around in the future (more on that shortly). If you notice fewer slot machines on casino floors you can look directly at electronic table games. These come in a variety of platforms from the small five-seat video blackjack game to massive dealer-assisted stadium gaming installations with blackjack, baccarat, and roulette. 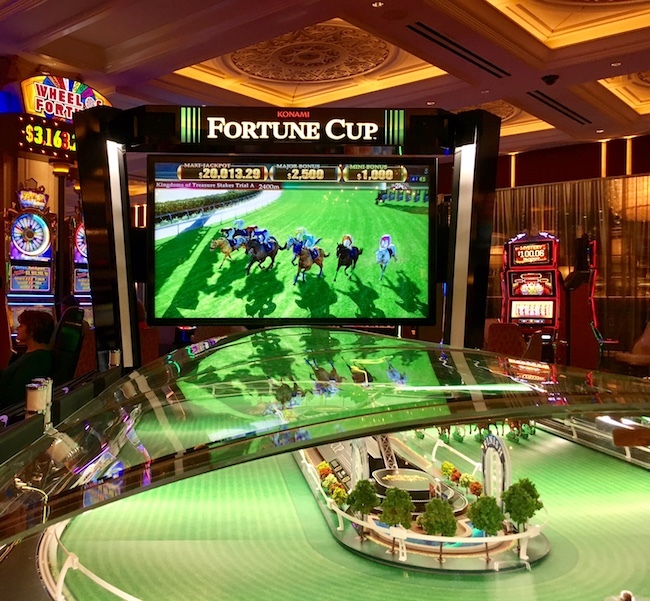 You’ll even find a new electronic game horse racing game like Fortune Cup occupying space once held by slot machines. Electronic table games aren’t new but they’re occupying more space in Las Vegas casinos than ever before. Manufacturers and casino operators say to expect even more of these machines since they offer an opportunity to generate greater revenue. Some Electronic Table Games offer the opportunity to make multiple wagers on multiple games at once. Players can have $5 in action on baccarat, roulette, blackjack and more at the same time. If the games continue to perform well, they’ll continue to expand and occupy more space in casinos. Unlike slot machines, these are games that offer greater payouts to players with better skill than others. Today you’ll find Gamblit Poker and Cannonbeard’s Treasure on various casinos in Las Vegas. Blackjack, poker, and video poker are traditional casino games where skill can affect how much a player wins or loses. These are head to head games for two to four players. Everyone ante’s up and plays for the pot. The casino takes their cut (ranges from about 5% to 15%) and the winner(s) take the rest. These new skill-based games are head to head for two to four players. Everyone will place an equal wager and play for the pot. The casino takes their cut (between about 5% to 15%) and the winner(s) take the rest. These games are still new to casinos and are different than every other game in the casino so you won’t see many people playing. That could change over time as players explore the new games. I think this will change significantly next year when Gamblit Gaming introduces Pac Man Battle. Most people old enough to gamble are familiar with how to play Pac Man. In 2018, we’ll be able to gamble on Pac Man. Gamblit will offer mobile games turned into casino games for money like Doodle Jump. The combination of themes for all generations of casino customers could catch on. If it does it wouldn’t be a surprise to see more space devoted to new skill-based table games and cabinets in the future. Esports has been a buzzword in Las Vegas casinos for the past couple of years. Very briefly, these are video game competitions for money. Esports Betting Report has a good guide if you want to understand this multi-billion dollar industry. Las Vegas casino operators love the energy and customers esports brings to their property. They also love the billions of dollars floating around the industry. There have been esports competitions in Las Vegas that have had anywhere from 20 people watching during one night to 20,000 people for a weekend. Expect to see more esports competitions in Las Vegas casinos in the next few years. Events can take place inside a venue, a ballroom or conference room, and in an arena. This isn’t something that will stand out on the casino floor right away. As casino operators find their way with esports it could find a home in traditional sportsbooks, in the events centers, and other venues in the future. Expect to see more forms of entertainment on the casino floor in the next few years. We’re already seeing virtual reality installations take place. These could someday become gambling platforms similar to esports tournaments and some skill-based games where guests play for entry fees after the casino operator takes their cut. The tournament platform could turn any part of a casino into a place to “gamble.” While untraditional, we’re already seeing this at Level Up at MGM Grand. Earlier this year they hosted separate competitions with Frogger and Golfstream. Racing games seem to be a popular new gambling platform. 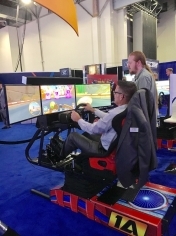 The demos I saw at G2E include wild driving games to stationary games. There are no plans for these games but Pac Man, Frogger, and Space Invaders may usher in a video game gambling section of the casino. The vision for the casino of the future always seems to be changing. One thing seems clear, there isn’t one particular casino of the future. Some of the concepts mentioned above might work for one casino and not another. There have been and will be so many technological advancements that we really don’t know what will be available in three years. Most Las Vegas casinos have different customers and offer experiences to fit these people.